Oral health is an extremely important part of a person’s overall health. Did you know that the American Dental Association states that you should visit your dentist for a routine cleaning and checkup at least once every six months? Poor oral health and dental care can often be the underlying causes of other health problems. It is easy for oral health problems like cavities, tooth decay, and more to occur if a person does not attend regular dental checkups. Regular dental checkups typically include full cleanings as well as an examination of a person’s gums and teeth. These types of checkups are extremely important because untreated cavities and other dental issues can lead to things like tooth decay, impacted teeth, and more. This is why it is extremely important to go to regular dental checkups at least once every six months. Not only do dental checkups provide routine cleanings and maintenance, but they can also help detect signs of oral cancer, gum disease, tooth decay, and more. During a routine dental checkup, you will go through a routine cleaning as well as full mouth examination and x-ray to check for and better identify any issues. Finding a good dentist is extremely important to maintain a good dental care regimen and dental treatment. 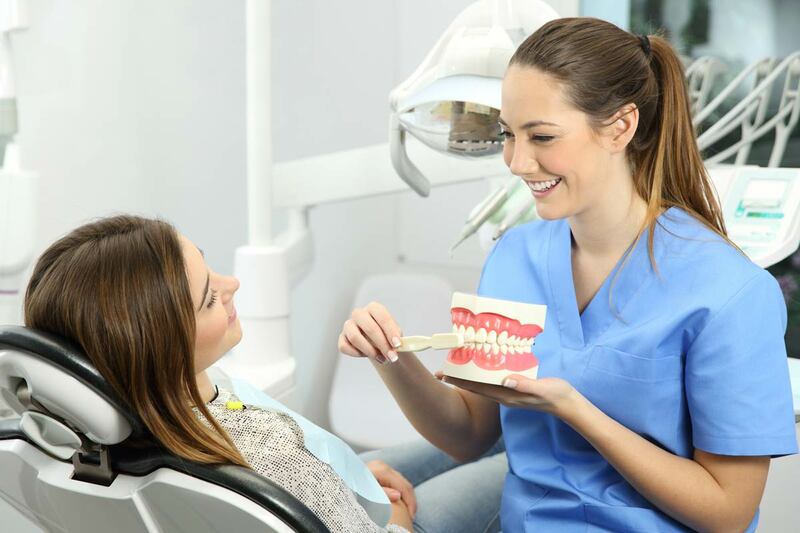 If you are searching for a new dentist, you should find a dentist who is not only certified and experienced but cares about their patients and is open to talking to you about your history and any concerns or questions you may have. Here are some of our best tips for finding a good dentist for all your oral health care needs. Ask your friends and your family for any recommendations they have for dentists. Ask them if they like their dentist and the dental treatment they had, what they like about them, and if they would recommend them. You can also ask your physician for a referral. If you are considering a new dentist but are unsure if they are the right fit for you, call them, or visit them first for a consultation before you make an appointment. This way you can find out the type of dental procedures they have completed and get an idea of what the office environment is like. Do you mind traveling a bit to see a dentist, or would you prefer to see someone in your area? Location is a big factor to take into consideration when choosing a good dentist. You should also find out what days of the week an office is open. Office hours are another factor you should take into consideration when searching for a new dentist. Another thing that you should think about is if the office is open on weekends. If you are busy during the week and can’t find the time to go to dentist appointments, you will want to find a dentist who is open on the weekends. Finding a dental office that is flexible can be a huge selling point for anyone who has a busy and hectic schedule. Dentists who offer emergency care are extremely valuable. You never know when you are going to have a dental emergency, and it will comfort you knowing that you have someone you can call in the event that an emergency does happen. This way you don’t have to worry about going to the emergency room and you can take solace in the fact that you can rely on a dentist who will be there for you if an emergency does occur. A good dental office has more than just a qualified and communicative dentist. The staff also play a huge role in the environment of the office as well as your overall experience. A nice receptionist and pleasant staff who are professional and make your visit enjoyable can go a long way. You can find out how the staff is by calling them first or even visiting the office in person before making an appointment. You may also want to take into consideration how the office looks and whether it is clean and has an open, friendly environment. A great dental office offers all sorts of services besides just regular cleaning. If you are looking for a new dentist, try to find one that offers multiple services. You can find this out by going to their website or even by simply calling them. Such services can include cleaning, root canal treatments, bridges, implants, teeth whitening, and more. Reviews say a lot about the service a business provides. While considering who to choose for your new dentist, go online and read any reviews online about the services offered. If you notice a trend of bad reviews that outweigh the number of good ones, it may be best to consider another option. Use online directories like www.emergencydentistsusa.com that can show you dentists who are in your area. These types of directories also usually come with reviews. Once you find a dentist in your area you can then do your research by calling them or even visiting the office. It is important to make sure that your dentist has all the necessary qualifications and certifications. In addition to this, the office should be up to date with inspections. Finding a dentist that is right for you can be difficult. Not only do you have to find someone that has the qualifications, but also the right location and hours. In addition, you will likely want a dentist who has good reviews as well as a friendly office staff to make the experience an enjoyable one. To make your search easier, try using websites like https://www.emergencydentistsusa.com to find listings of dentists from all across the United States.